Moscow, May 25 -- At 3:15 PM today the gorgeous regalia, which will be used at the ceremony tomorrow , was transferred with great pomp from the Treasury to the throne room, the hall of St. Andrew, in the Kremlin Palace . The most important of these is the magnificent crown , which was manufactured by a Geneva jeweler , at the command of the Empress Catherine II , immediately after her accession to the throne. It somewhat resembles a mitre, surmounted by a cross of five flawless diamonds, and the celebrated pear-shaped ruby , which has scarcely a superior in the world. This forms the only touch of color, the rest of the stones being diamonds and pearls. The setting is of silver, and there is a band of purple velvet inside. The value of the crown is over 1,100,000 rubles, but that of the sceptre surpasses it. Made for the coronation of the Emperor Paul I in 1797, it is the most wonderful thing of its kind which has ever been known, for the famous Orloff diamond surmounts it . 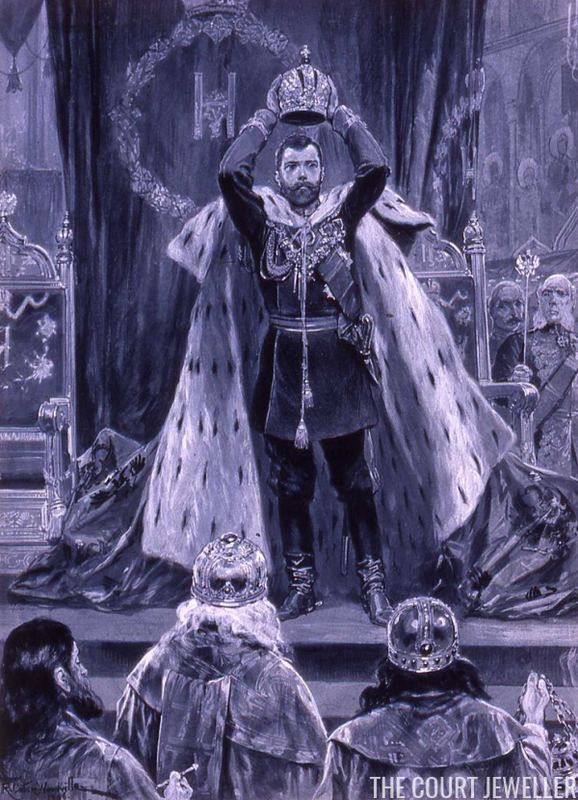 The orb  also dates from the reign of Czar Paul, and is of solid gold, set with three rows of diamond brilliants and a huge, almond-shaped diamond. The diamond cross is supported by an exquisite sapphire, worth a fortune. The Czar will also don the collar, star, and jewel of the Order of St. Andrew , valued at over 100,000 rubles. This order is never worn save on the day of a coronation, and is adorned with five pink diamonds and two Siberian aquamarines, one blue and the other green, set in diamonds. The jewels which the Czarina will wear are little inferior in value. The state coronet contains stones of unequalled beauty. The necklet worn with it consists of huge single stones, with hanging pendants of still larger diamonds. 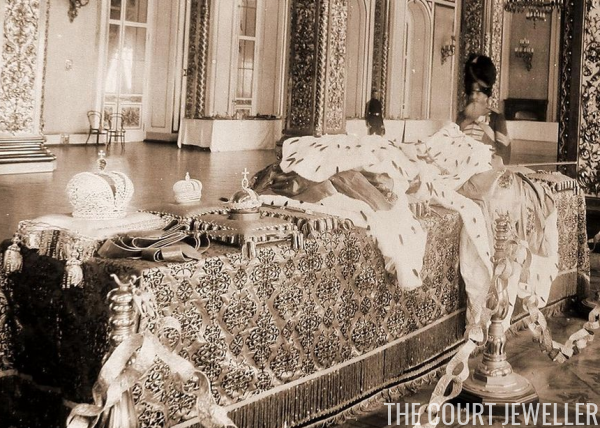 The coronation robe is the most costly ever beheld, and the masses of precious stones which Her Imperial Majesty will wear, in addition, will be of incredible value. They include the smaller insignia of the St. Andrew order, set with gems representing a fortune. These magnificent symbols of authority will remain in the throne room during the night, guarded by a detachment of the grenadiers of the palace and several gentlemen of the court. This afternoon the Emperor and Empress left the Palace of Alexandrina and took up their quarters in the Kremlin. Their chief devotions were paid today in the Cathedral of the Redeemer, a small chapel upon the Gold Court, surmounted by twelve gilded cupolas. This private chapel of the palace contains a miracle-working image of the saviour, and here, before the golden Ikonostas, the imperial couple perform their acts of preparation for the morrow's sacred ceremony. All day long preparations have gone forward for tomorrow, and many of the tribunes which were erected for the triumphal entry have been removed, so that more space can be given for the massing of soldiers and the entrance and grouping of invited guests. The decorations throughout the city have been looked to and renewed where necessary. Full preparations for the illumination have been made, so much so that had a stranger happened upon Moscow today, he might almost have thought a new town was in process of erection. Special masses have been said at all the churches in Moscow today, with appropriate prayers for blessings on the Emperor and Empress upon their coronation. The weather throughout the day was clear and bright. A rehearsal of the grand gala performance which will be given at the Grand Theatre, or Opera House, of Moscow, was held tonight. Clifton R. Breckinridge, the American minister, gave a dinner tonight at the house, in the Rejdestversk Boulevard, where the legation is lodged during coronation ceremonies. After the dinner a reception was given, which was a very brilliant affair. A large number of officials and all the prominent Americans in the city were present. Among the latter were General and Mrs A. McD. McCook and their daughter, Mrs. Alexander of New York; Admiral Selfridge and staff; and Mrs. Potter Palmer of Chicago . General McCook, who is the special representative of the American government, his wife and daughter, and Admiral Selfridge were among the guests at a dinner given by the German ambassador last night. At the reception given at the Kremlin on Friday last, the Czar conversed for a long time with General McCook. His Majesty asked many questions about the United States, which showed that he had much knowledge of that country. 1. 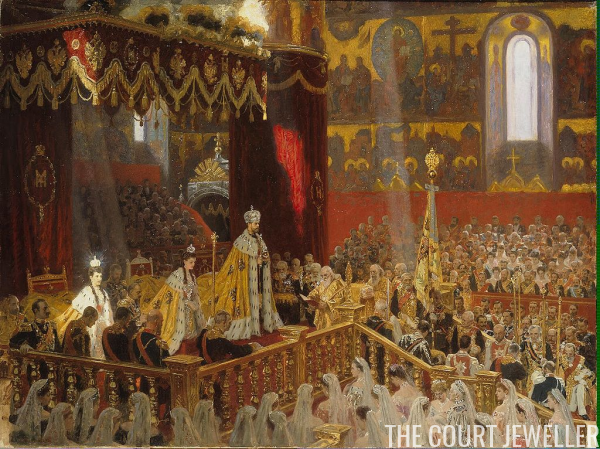 The ceremony in question was the coronation of Nicholas II, the last emperor of Russia. He was crowned more than a year after becoming emperor; the official period of mourning for his father, Emperor Alexander III, did not end until November 1895, and the coronation was scheduled for the following spring. In the time between his accession and his coronation, Nicholas became a husband (marrying Princess Alix of Hesse) and a father (to his first daughter, Grand Duchess Olga Nikolaevna). 2. 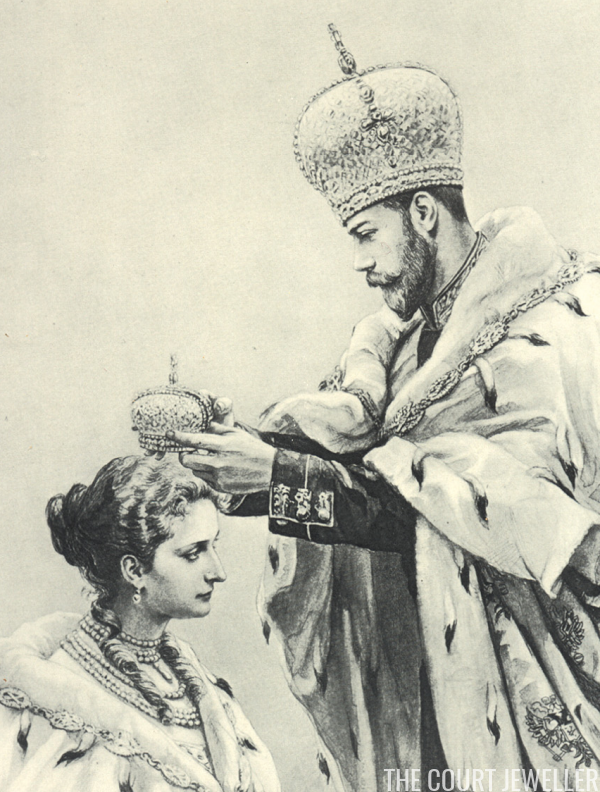 Russian monarchs were traditionally crowned in Moscow, and Nicholas II followed that tradition, even though Saint Petersburg was the capital city at the time. The word "kremlin" means something like "citadel" in Russian; the Moscow Kremlin is a complex of buildings that includes a number of palaces and cathedrals. Nicholas was crowned in the Cathedral of the Dormition within the complex walls. His was the last coronation to be held in the cathedral; all monarchs since Ivan the Terrible (in 1547) had been crowned there. 3. The Imperial State Crown of Russia, made in 1762 and set with nearly five thousand diamonds. The crown is owned today by the Moscow Kremlin Diamond Fund and is on display in the museum in the Kremlin Armoury in Moscow. 4. 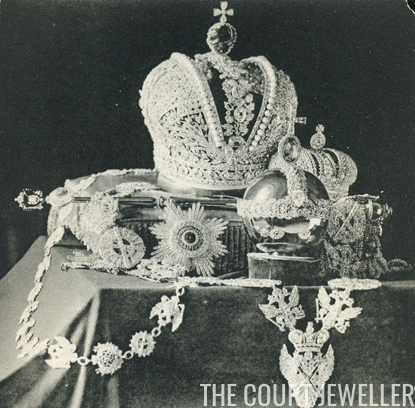 The crown was made by Georg Friedrich Ekart and Jérémie Pauzié, Swiss jewelers working at the Russian court. 5. Catherine the Great (1729-1796), the German princess who seized the Russian throne in a coup d'etat following the assassination of her husband, Emperor Peter III. Her reign is considered an important "golden age" of imperial Russia. 7. 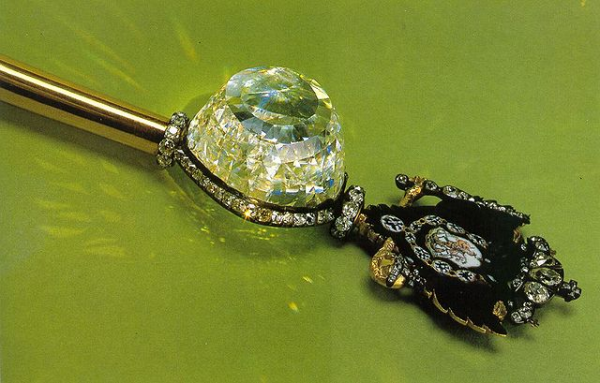 The Imperial Sceptre (and the Orlov Diamond) are both owned by the Diamond Fund today and are housed in the Armoury museum at the Kremlin in Moscow. 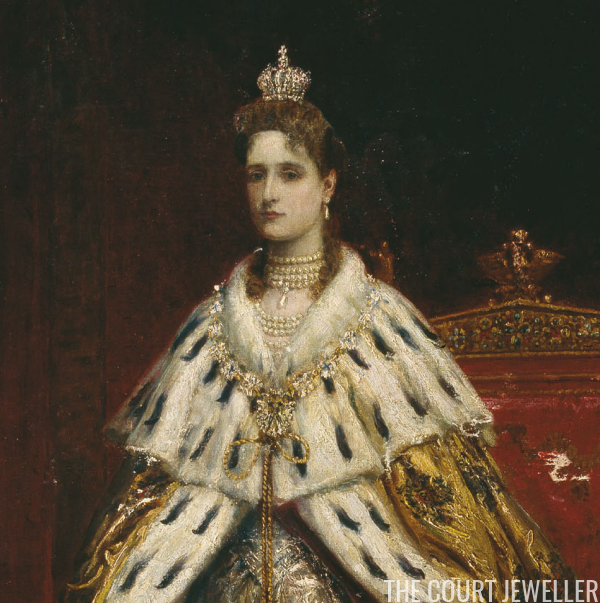 The diamond originated in India; it came into the Russian crown jewel collection when Count Orlov, a former lover of Catherine the Great (and the father of her youngest child, Count Bobrinsky), offered it as a gift to the empress. The diamond reportedly weighs around 190 carats. 8. The Imperial Orb is also owned by the Diamond Fund and is also on display at the Armoury in the Kremlin. 9. The Order of St. Andrew the Apostle is the highest-ranking order of Russian chivalry. Inaugurated in 1698, it was abolished following the 1917 revolution but reestablished in 1998. 10. Bertha Palmer (1849-1918) was the wife of the millionaire Chicago developer Potter Palmer; you may recognize their name from the city's famous Palmer House Hotel. Why was she at this coronation? Some scholars have posited that the Russian trip was somehow connection to her desire to have her husband appointed as ambassador to Germany (and her disappointment when that didn't happen).